Floating static routes are known as something different in the world of Juniper. Qualified Next Hops. It allows an independent routing preference on a route where there is two routes to the same destination. This blog here will show you how to configure this route. Below is the topology I am using. The idea on this setup is if a direct peered upstream router drops you have a deterministic failover situation. Here I assume interfaces have been setup and we are just focusing on the static routing. A static route has a defined routing preference of 5 by default; as set by Juniper. The backup or floating route I have defined is set at 6. Lower is better in the case of routing. 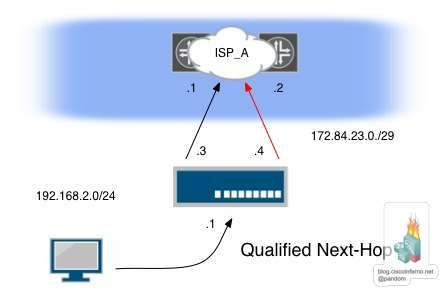 When the route being used is withdrawn from the routing table the qualified next-hop comes into play. Now just a show command under routing-options to see the config. Now to look at the routing table. Here I am simulating a failover of the upstream link. Now to check the routing table to see if failover occurred. There you go. As expected the function of the qualified next-hop on JUNOS. Add that to your IOS to JUNOS transition skill set.